"This antique Chinese silk large beaded tassel trim mahjong game table cover dates from the 1920's. It is made of a black silk center square, with an aqua green bluish brocade ribbon trim border edging woven design of animals including a crane and spotted deer. The crane is a symbol of longevity and the deer symbolizes riches. 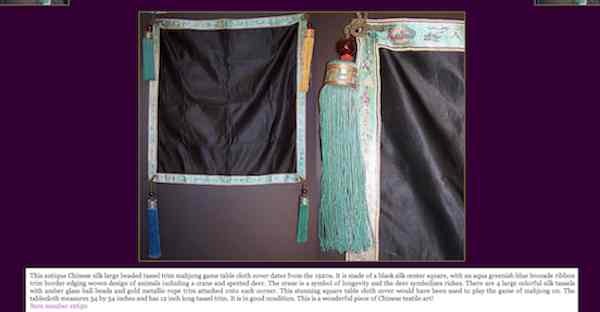 There are four large colorful silk tassels with amber glass ball beads and gold metallic rope trim attached onto each corner. This stunning square table cloth cover would have been used to play the game of mahjong. The tablecloth measure 34 by 34 inches and has 12 inch long tassel trim. It is in good condition This is a wonderful piece of Chinese textile art!"